Mulch or Pine Straw? We Can Help You Choose! Sharp Tree Service can install mulch or pine straw in your yard to make it look great! There are quite a few compelling reasons to install mulch or pine straw to improve the overall health of your lawn, your plants and, of course, your trees. Let’s find out more! First, why use mulch or pine straw at all? While some people love the look mulch gives a lawn, the main reasons for using pine straw or mulch revolve around plant protection. Mulch or pine straw can help insulate the soil, keeping moisture in during the summer and heat on the ground surrounding root systems in winter. 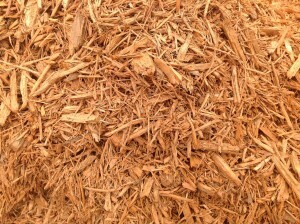 Let’s take a look at some similarities and differences between mulch and pine straw, so that you can decide which is better for you. Whichever one you pick, we can install! Pine straw is, of course, collected from pine trees throughout the year as they shed. Pine straw is very environmentally friendly because it doesn’t require any trees to be cut down. Once collected, the needles are cleaned and baled before being distributed onto a lawn. Pine straw, like mulch, creates a barrier between the root zone of plants and the elements. It helps keep moisture in during the summer and heat in during the winter. Pine straw has the added advantage of improving the soil as it breaks down. Pine straw makes the soil a bit more acidic, making it an excellent choice for acid-loving plants such as azaleas, hydrangeas, dogwoods and magnolias. 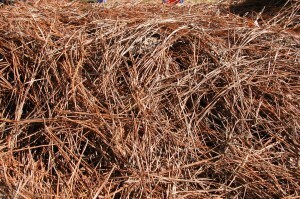 Mulch can function in a similar fashion to pine straw, but can be made of a wide variety of materials. It mostly can be divided into two big categories: organic and inorganic. We’re mostly going to focus on organic mulch in this article. However, if you’re curious about examples of inorganic mulch, just think or gravel, sand or minutely shredded tires used on playground surfaces. Organic mulch can be reclaimed wood chips from cutting down or pruning the limbs of a tree, grass clippings from mowing the lawn, or even reclaimed cardboard or newspaper. Mulch, like pine straw, can create an insulating layer between the root zone of a plant and the elements. Like pine straw, this will help the soil retain water and maintain a warmer ground temperature in the winter. Proper installation of mulch is important. Improperly installed mulch can lead to tree diseases such as crown rot, so please, call an expert! At Sharp Tree Service, we are ready to install pine straw or mulch for you, just give us a call or use the contact form on our website. See you soon!